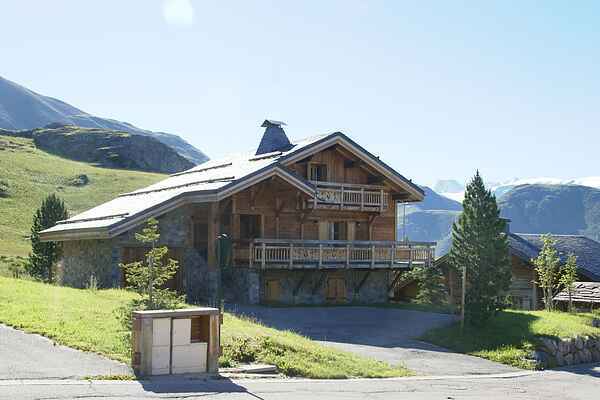 The luxury chalets are situated just outside the bustling center of Alpe d'Heuz and offer stunning views over the beautiful surroundings. In total there are five different types available. To begin there is the FR-38750-10. This luxurious house can accommodate 12 people. Type FR-38750-14 can also accommodate 12 people. In addition to that there is FR-38750-11. This type is also suitable for 12 people but has an extra bedroom and bathroom compared to previous types. Also, there is FR-38750-12. This house can accommodate 16 people and is the only one without a south-facing balcony. Finally, there is FR-38750-13. This holiday home is also suitable for 16 people but has additional bedrooms and bathrooms compared with FR-38750-12. All types have been very luxuriously furnished, they have a fireplace in the living room, a spacious kitchen, a washer and dryer and they all (except FR-38750-12) have a south-facing balcony. To complete the picture, all types have been equipped with a sauna or whirlpool. In short, enjoy.